^ a b c McGurk, Dennis; Cotting, Dave I.; Britt, Thomas W.; Adler, Amy B. (2006). "Joining the ranks: The role of indoctrination in transforming civilians to service members". In Adler, Amy B.; Castro, Carl Andrew; Britt, Thomas W. (eds.). Military life: The psychology of serving in peace and combat. volume 2: Operational stress. Westport: Praeger Security International. pp. 13–31. ISBN 978-0275983024. ^ a b c d e f g Gee, David; Taylor, Rachel (1 November 2016). "Is it Counterproductive to Enlist Minors into the Army?". The RUSI Journal. 161 (6): 36–48. doi:10.1080/03071847.2016.1265837. ISSN 0307-1847. ^ a b c d e Boothby, N; et al. (2010). "Child soldiering: Impact on childhood development and learning capacity". Retrieved 30 January 2018. ^ a b Ursano, Robert J.; Kessler, Ronald C.; Stein, Murray B.; Naifeh, James A.; Aliaga, Pablo A.; Fullerton, Carol S.; Wynn, Gary H.; Vegella, Patti L.; Ng, Tsz Hin Hinz (1 July 2016). "Risk Factors, Methods, and Timing of Suicide Attempts Among US Army Soldiers". JAMA Psychiatry. 73 (7): 741–9. doi:10.1001/jamapsychiatry.2016.0600. ISSN 2168-622X. PMC 4937827. PMID 27224848. ^ UK, Ministry of Defence (2017). "UK armed forces suicide and open verdict deaths: 1984-2017". Retrieved 24 May 2018. ^ a b Head, M.; Goodwin, L.; Debell, F.; Greenberg, N.; Wessely, S.; Fear, N. T. (1 August 2016). "Post-traumatic stress disorder and alcohol misuse: comorbidity in UK military personnel". Social Psychiatry and Psychiatric Epidemiology. 51 (8): 1171–1180. doi:10.1007/s00127-016-1177-8. ISSN 0933-7954. PMC 4977328. PMID 26864534. ^ a b "AFRICA: Too small to be fighting in anyone's war". UN Office for the Coordination of Humanitarian Affairs. December 2003. Archived from the original on 25 March 2013. Retrieved 3 August 2009. ^ Coalition to Stop the Use of Child Soldiers (2001). "Global Report on Child Soldiers". 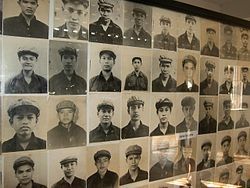 child-soldiers.org. Retrieved 16 May 2018. ^ a b Hagopian, Amy; Barker, Kathy (1 January 2011). "Should We End Military Recruiting in High Schools as a Matter of Child Protection and Public Health?". American Journal of Public Health. 101 (1): 19–23. doi:10.2105/ajph.2009.183418. ISSN 0090-0036. PMC 3000735. PMID 21088269. ^ "Soldiers of Misfortune: Abusive U.S. Military Recruitment and Failure to Protect Child Soldiers". American Civil Liberties Union. Retrieved 13 December 2017. ^ "Protocol II Additional to the Geneva Conventions of 12 August 1949". ohchr.org. 1977. Archived from the original on 4 November 2013. Retrieved 28 March 2018. ^ a b c d e "Optional Protocol to the Convention on the Rights of the Child on the Involvement of Children in Armed Conflict". ohchr.org. 2000. Archived from the original on 2 May 2013. Retrieved 22 March 2018. ^ Rakisits, Claude (1 December 2008). "Child Soldiers in the East of the Democratic Republic of the Congo". Refugee Survey Quarterly. 27 (4): 108–122. doi:10.1093/rsq/hdn054. ISSN 1020-4067. ^ Solidarity Peace Trust (2003). "National youth service training" (PDF). Archived from the original (PDF) on 5 September 2008. Retrieved 29 March 2018. ^ Bjørkhaug, Ingunn (28 June 2010). 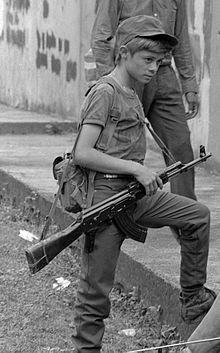 "Child Soldiers in Colombia: The Recruitment of Children into Non-State Violent Armed Groups". SSRN 1650250. ^ Child Soldiers International (2008). 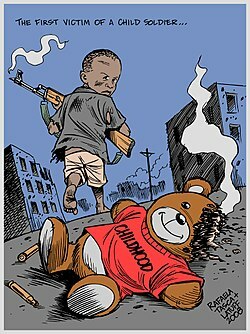 "Child Soldiers Global Report 2008 – Colombia". Archived from the original on 23 September 2013. Retrieved 22 March 2018. ^ "Child Soldiers Global Report 2004". Archived from the original on 17 December 2004. 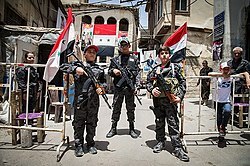 (2.29 MB) Child Soldiers International, p. 304 cites in footnote 18 that this Information is from Palestinian human rights Monitoring Group (PHRMG), March 2004. ^ Child Soldiers International (2001). "Child Soldiers Global Report 2001 – Turkey". Refworld. Archived from the original on 29 October 2014. Retrieved 22 March 2018. ^ Mordaunt, P (4 July 2016). "Letter to Child Soldiers International, 4 July 2016". Retrieved 11 February 2018. ^ New Profile (2004). "The New Profile Report on Child Recruitment in Israel" (PDF). Retrieved 10 December 2017.